The following cases were heard under the Aroostook Criminal docket at the Caribou Courthouse during the month October. 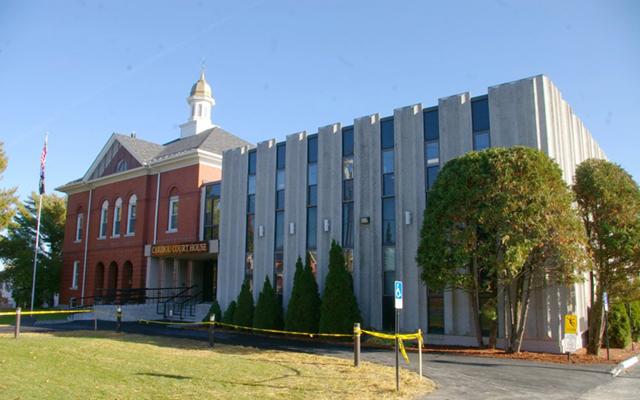 CARIBOU, Maine — The following cases were heard under the Aroostook Criminal docket at the Caribou Courthouse during the month October. Daniel R. Sparks, 45, Fort Fairfield: probation violation, probation revoked, no sentence imposed. David M. Berkley, 29, St. Agatha: probation violation, no sentence imposed. Keith A. Brissette, 26, Washburn: probation violation, 11 months in prison, probation revoked. Mitchell D. Hanning, 28, Mapleton: probation violation, 30 days in jail, probation partially revoked, probation continued. Michael Cash, 26, Woodland: probation violation, 7 months in jail, probation revoked. Nathan Morrow, 25, Caribou: operating after habitual offender revocation, prior, $2,000 fine, 48 months in prison. Philip Dionne, 63, Caribou: domestic violence assault, 22 days in jail. Colby Conroy, 24, Woodland: gross sexual assault, 42 months in prison all but 18 months suspended, two years probation; unlawful sexual touching, three months in jail; unlawful sexual contact, six months in jail; sexual abuse of a minor, six months in jail. Steven C. Cray, 35, Washburn: operating after habitual offender revocation, prior, $1,000 fine, seven months in jail. Shannon L. Prestwood, 40, Connor Twp. : unlawful trafficking in scheduled drugs, dismissed. Leanne R. LaCombe, 34, Caribou: attaching false plates, 48 hours in jail; unlawful possession of scheduled drug, $400 fine, 20 days in jail; unlawful possession of scheduled drug, dismissed; operating while license suspended or revoked, $250 fine. Zachary J. Smith, 31, Caribou: aggravated assault, 42 months in prison all but nine months and one day suspended, two years probation; domestic violence assault, six months in jail; criminal mischief, 10 days in jail, $173 restitution. Amanda Rakes, 25, Presque Isle: operating while license suspended or revoked, prior, $500 fine. Nathan Jones, 30, Limestone: permitting unlawful use, filed on $150 costs. Veronica R. Lopez, 28, Caribou: operating while license suspended or revoked, $250 fine; false public alarm or report, $150 fine. Dino A. Dinatale, 56, Woodland: displaying fictitious vehicle certificate, $100 fine. Shawna LaPointe-Cormier, 24, Van Buren: violating condition of release, $250 fine. Michelle L. Akerson, 30, Houlton: fishing in restricted area, $100 fine. Justin Akerson, 22, Houlton: fishing in restricted area, $100 fine. Mark M. Couturier, 49, Manchester: failing to register vehicle, $100 fine. Christina Lovely, 34, Washburn: assault, $300 fine. Michael C. Cash, 26, Woodland: assault on an officer, 18 months in prison all suspended, two years probation; refusing to submit to arrest or detention, physical force, dismissed. Zachary Roman, 20, Caribou: theft by unauthorized use of property, $250 fine, $2,455.23 restitution; driving to endanger, dismissed; operating vehicle without a license, $200 fine; failing to make oral or written accident report, $200 fine. Aubrey Thibodeau, 23, Caribou: operating while license suspended or revoked, filed on $25 costs. Marion Felty, 59, Caribou: operating under the influence (alcohol), $500 fine, five days in jail, 150-day license suspension. Daniel R. Ferranti, 28, Presque Isle: attaching false plates, $200 fine; violating condition of release, 10 days in jail. Michael Allen Latronica Jr., 41, Washburn: operating while license suspended or revoked, $250 fine. Corey Pinette, 27, Caribou: criminal mischief, $100 fine, $100 restitution. Mary Albert, 46, Limestone: disorderly conduct, offensive words, gestures, $100 fine. Nicholas Gumprecht, 25, Washburn: operating while license suspended or revoked, $250 fine. Kari Howe, 31, Caribou: OUI (drugs or combo), dismissed. Robert Grosser, 38, Woodland: operating vehicle without license, $250 fine. Kara Dewley, 26, Limestone: operating while license suspended or revoked, $250 fine. Shawn Collin, 35, Biddeford: operating while license suspended or revoked, prior, $500 fine: attaching false plates, $100 fine. Samantha Rossignol, 36, Caribou: failing to register vehicle, $100 fine. John M. Sutherland, 48, Fort Fairfield: unlawful use of bait in artificial-lure- only water, $100 fine. Matthew Gagnon, 33, Fort Fairfield: fishing without valid license, $100 fine. Stephen M. Desmond, 34, Caribou: unlawful possession of methamphetamine, $400 fine, nine month and one day in prison. Philip Dionne, 63, Caribou: OUI (alcohol), $500 fine, 150-day license suspension; violating condition of release,10 days in jail. Danielle A. McQuarrie, 37, Madawaska: unlawful possession of heroin, $400 fine, 40 months in prison; refusing to submit to arrest or detention, physical force, six months in jail; violating condition of release, six months in jail. Devin Roy, 18, Caribou; attaching false plates, $100 fine. James E. Pelletier, 45, Frenchville: failure to register vehicle, $100 fine. Matthew Ranks, 45, Chelsea: failure to register vehicle, $100 fine. Drew Allan Erickson, 32, Orrs Island: hunting without valid license, $100 fine. Michael Fraser, 28, Limestone: domestic violence assault, 48 hours in jail; criminal mischief, 48 hours in jail, $500 restitution; refusing to submit to arrest or detention, refusing to stop, 48 hours in jail. Timothy Stubbs, 31, Caribou: operating ATV on public way, $100 fine. Danielle Higgins, 24, Madawaska: use of drug paraphernalia, $300 fine. Daniel Forbes, 38, New Sweden: operating unregistered ATV, $200 fine.